Android Studio – the default development environment for Android developers, with an update to 3.2 has brought about interesting changes to the Android Studio ecosystem. This feature enables developers to snap the recent state of the emulator as and when needed. A snapshot preserves the entire state of the device at the saved time. This includes OS settings, application state and user data. Users can load the saved state by opening the snapshot, thus saving time. Snapping a shot is even faster, comparatively to save and load in this stable release. This is due to the under-the-hood speed enhancements. Therefore developers or testers can accelerate the speed of test run using the Android Emulator Snapshots. This is one of the vital features in Android 3.2. It helps developers in understanding the energy impact of the application on an Android device. Developers can visualize the estimated energy usage of system components and can inspect background events due to which battery drains. They can effectively manage the power consumption of apps in different scenarios, thus improvising the battery life of the device. To visualize the look and feel of a layout while designing the app, developers can add sample preview data to TextView, ImageView, or a RecyclerView from within the Layout Editor. This aids in the design of layouts that depend on run time data. While migrating from the Android Design support library to the new Material Components app theme and library, Android Studio 3.2 will offer access to new and updated widgets such as buttons, card layouts, text views, new font styles and more. Developers can now easily migrate from old library to new AndroidX packages with the refactoring tools. Android Studio 3.2 comes with Kotlin 1.2.61, with support for the Kotlin-friendly latest Android version – 9 Pie SDK. This is the new app publishing format that is designed to help deliver smaller APKs to users and to reduce the download size of android application. Google Play’s new app serving model, called Dynamic Delivery, processes app bundle to generate and serve optimized APKs for each user’s device configuration, so they download only the code and resources they need to run the app. With Android Studio 3.2 or via the command line, we can easily build your code as an app bundle and get the benefit of smaller APKs based on language, screen density, and ABIs with no changes to app code. Slices are UI templates that embeds portions of app in other user interfaces on android. It displays rich and dynamic content. For example, using Slices it is possible to show app functionality and content in Google Search suggestions. The built in template in android studio 3.2 helps in extending the app with the Slice Provider APIs as well as new lint checks to ensure that you’re following best practices when constructing the Slices. Jetpack has been updated and improved and has made the overall development process much smoother and easier. It minimizes repetitive work and thus helps in streamlining the development workflow. 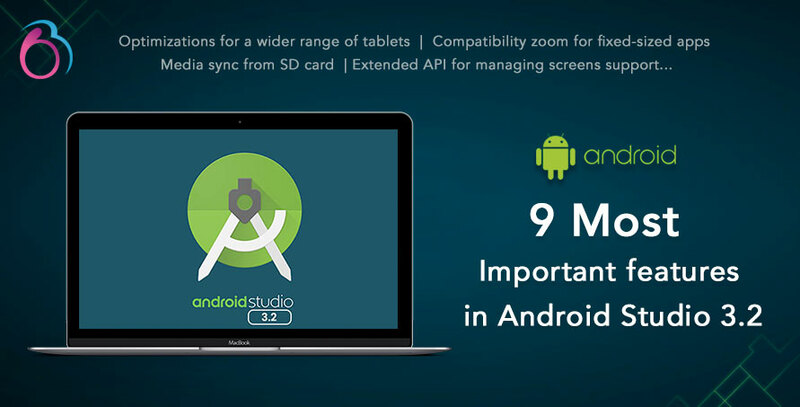 With these new changes in android studio 3.2, some cool new smart features have been incorporated, which are sure to help the developers create better and faster apps more efficiently and save a lot of their development time.